One thing about the Flash based web game, Desktop Tower Defense: you’ll easily get hooked with it and soon you’ll realize you can hardly do your other tasks with your computer because you’re playing with it for a long time. This game is relatively easy to play but is very tough to master. Definitely a very challenging one. 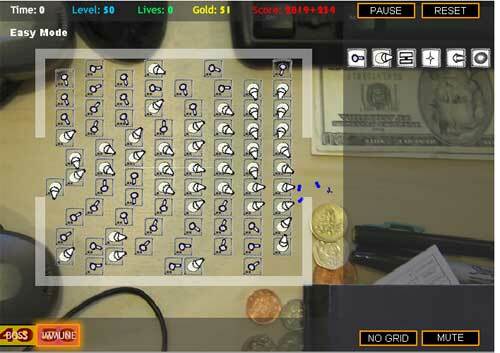 In the site’s description, Desktop TD is a flash based puzzle or strategy game that involves building and upgrading a variety of defensive, immobile tiles in order to prevent the Autumn Crossing creeps from crossing the screen. Loosely based from Warcraft 3 Tower defenses, the creeps aren’t required to follow a path, finding the shortest route from the starting to the ending location. It may sound easy and simple but having the creeps as if they have minds of their own, make the whole game very challenging, thus making you more engaged with the whole game. Easily adjudged as one of the best, as well as innovative yet simple, games to be introduced this year, it provides different levels of difficulty which are Easy, Medium and Hard, with nine challenge modes and four fun modes. Conquering the Hard the level might not be impossible but it’s definitely a task thing to beat. This game is highly recommended for fans of tower defense and strategy games.